The C104 Kris by Ed Schempp was introduced in 2006. The design is influenced by a type of dagger or sword used for example in the southern Philippines or Indonesia called kris or keris (see e.g. here for more information about krisses in general). In 2008 the C104 was discontinued. 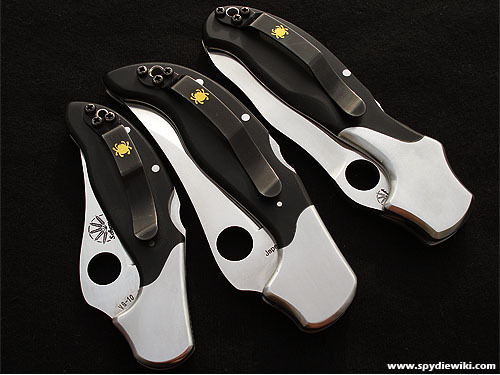 The C104 Kris appeared in the 2006 and 2007 Spyderco product catalogs (older, newer). "Kris First Impressions" thread on the Spyderco forums, including first impressions by "eljay" and "Pretune your knife" instructions by "Ed Schempp". "eljay" posted more info in the "Kris Update" thread. Info and review by one of "TazKristi's" LEO accounts. "If you consider it, every civilization both ancient and modern has historically developed its own variety of cutlery that is representative of its culture, ethnicity and cutting requirements at the time. Spyderco unveiled its first ethnic inspired knife with a Shabaria folder, reminiscent of classic Middle Eastern cutlery. Next up, a Japanese Tanto then a Chinese Folder. In 2003 we released a Persian knife followed by an Indonesian Karambit blade. 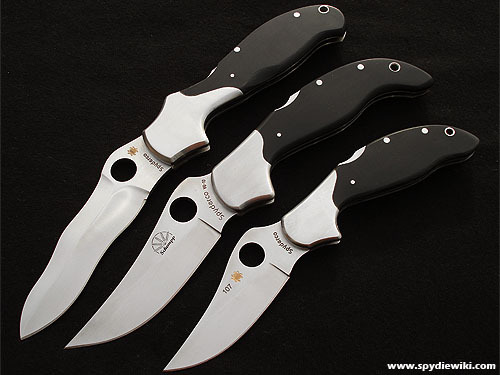 The latest installment Spyderco’s Ethnic Knife Series is a Kris folder designed by custom knifemaker Ed Schempp. Kris blades come in several diverse profiles but traditionally incorporate some form of a wave pattern in the blade. Historically they represented a Moro (Philippine) man’s societal standing, provided talismanic benefits and were utilized for defense. The C105 Kris’ curvy blade fundamentally becomes a cutting edge with oversized serrations, transforming its cutting properties. The curvy profile markedly continues into the handle providing a variety of grip options. The VG-10 steel blade comes hollow-ground, with a pronounced swedge grind running from mid-blade to the spine and is PlainEdged. Milled Micarta handle scales are capped with polished steel bolsters. Locking bar is equipped with a David Boy Dent and the clip is embellished with a gold colored Spyderco logo bug. The pocket clip positions the folder right-handed, tip-up." This page was last modified on 2 March 2009, at 19:52.